ARLINGTON, VA; October 3, 2016 – PBS announced today that USO – FOR THE TROOPS, an independent documentary film that chronicles the iconic American institution created 75 years ago to bring pieces of home to active duty troops around the world, will air Monday, November 7, 2016, 9:00-10:00 p.m. ET (check local listings) on PBS. The film is narrated by Oscar nominee David Strathairn. Produced by Partisan Pictures and directed by Peter Schnall, with exclusive support from Johnson & Johnson, the film examines the history of the USO, which was formed in 1941 by President Roosevelt, who consolidated the functions of six separate groups into the United Service Organizations (USO). The story of the USO and how it has kept military service personnel connected to family, home and country for more than seven decades is told against the backdrop of a recent USO tour that spanned seven countries in eight days. USO – FOR THE TROOPS offers unprecedented access to the background operations that make it possible for celebrities to travel across the world to meet and perform for active duty troops. Interviews with celebrities who have been on USO tours, including Jon Stewart, Jay Leno, Ann-Margret, Raquel Welch, Connie Stevens, country singer Craig Morgan, NFL player Charles Tillman, Miss America Betty Cantrell and others, are interspersed with moving first-person accounts. The film also includes interviews from current and former veterans, historians who discuss the USO’s mission and the often-complicated cultural context within which they work, and comments from USO leaders as well as American leaders like former President George W. Bush and former Secretary of State Colin Powell. 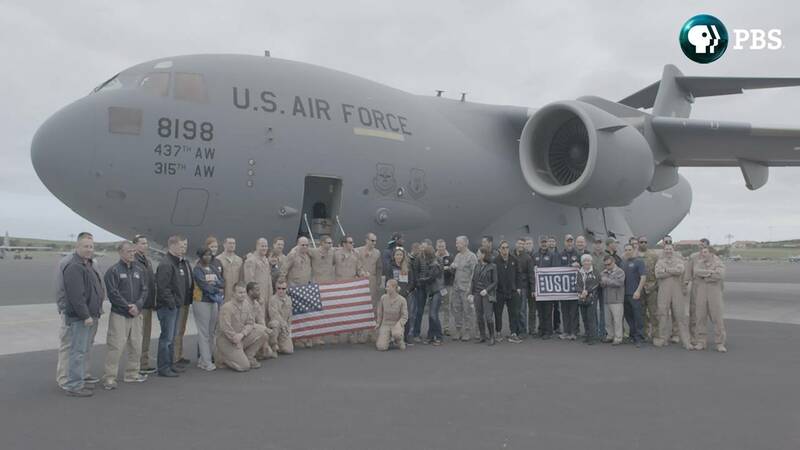 From Joint Base Elmendorf in Alaska to the Baghdad Diplomatic Support Center in Iraq, from performances on stage to overnight flights in the belly of a C-130 transport plane, the film showcases the fast pace, excitement, and complex logistics of a modern USO tour. Archival footage of classic celebrity performances from WWII to the current day is interspersed throughout the documentary, providing viewers with new insights into intersections among American culture, warfare and the USO. USO – FOR THE TROOPS is produced by Partisan Pictures. Director: Peter Schnall. Producers: Margaret McEvoy, Teresa Giordano & Peter Schnall. Editor: Lucas Groth. Writer: Teresa Giordano. Associate Producer: Brian Becker. Coordinating Producer: Siri Helleloid. Founded by seven-time Emmy-winning producer and cinematographer Peter Schnall, Partisan Pictures is a pioneer in documentary film and television, with a reputation for producing insightful films – true stories distinguished by humanity, intrigue and integrity…and the highest network ratings. Since 1997, Partisan Pictures has been proud to have a world-class team of innovative writers and producers who constantly re-imagine how stories can be brought to life for the most respected non-fiction networks in television, including PBS, History Channel, Discovery and National Geographic Channel. From adventure and intrigue to science and history, Partisan Pictures brings big screen, cinematic technique to the small screen to create a visceral experience that connects audiences with the world.